You have seen what we say about ourselves. Here is what other people have to say about us: In the Fall of 2013, the Franklin Street Train Station project won the Architectural Woodwork Institute's "Award of Excellence" and was featured in an article in the Fall 2013 edition of their Design Solutions magazine. Click here to read the article. "Thanks for all your efforts and particularly the guidance and recommendations during the restoration of the Mylin Farmhouse. You are particularly diligent and committed to the end result and I'm sure we are not the only customer to have benefited. Jim Cluck, Willow Valley Retirement Communities"
Repointing a historic building’s bricks with modern mortar can cause deterioration? Using cheap paint can permanently damage the surface to which it is applied? Installing aluminum and vinyl siding over wood siding means trading a product that can last 200-plus years for ones that last 50 to 60 years? These are just three of 10 mistakes people make when upgrading historic properties, according to Danielle Groshong-Keperling and her father, Charles Groshong. .... click here to read the full article. 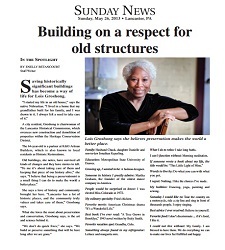 Sunday News, Sunday, May 26, 2013, Lancaster, PA Building on a respect for old structures By ENELLY BETANCOURT Staff Writer “I started my life in an old house,’’ says the native Nebraskan. “I lived in a home that my grandfather built for his family,and I was drawn to it. I always felt a need to take care of it.” A city resident, Groshong is chairwoman of the Lancaster Historical Commission, which oversees new construction and demolition of properties within the Heritage Conservation District. The 64-year-old is a partner at K&G Artisan Builders, which is also known to local residents as Historic Restorations. Old buildings, she notes, have survived all kinds of changes and they have stories to tell. “To me it’s about taking care of them and keeping that piece of our history alive,’’ she says. 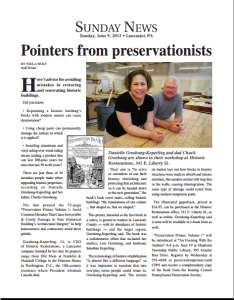 “I believe that being a preservationist is a small thing I can do to make the world a better place.” ....to read the full article, click on the picture on the right. At around 9 a.m. on Wednesday, July 1, 1863, Lancaster-born Gen. John F. Reynolds drew rein at the Lutheran Theological Seminary just west of the town of Gettysburg. "What's the matter, John?" he shouted to Gen. John Buford from the cupola atop the seminary roof. Buford had been anxiously watching as his cavalrymen held back the long lines of Confederate infantry approaching the town. "The devil's to pay," Buford called back and climbed down to confer with Reynolds. Those were the opening moments of the Battle of Gettysburg. And while Reynolds would die two hours later, and Buford within six months, the building where they met, Schmucker Hall, still stands. To ensure that the landmark structure maintains its historical integrity, a Lancaster firm is performing extensive restoration work. "When we're finished, Schmucker Hall will look just like it did during the Civil War," said Danielle Keperling, who, with her husband, Jonathan, owns and operates Historic Restorations. Intelligencer Journal and the Lancaster New Era, Wednesday, May 5, 2011, Lancaster, PA People know of Ford's Theatre, where on April 14, 1865, John Wilkes Booth shot Abraham Lincoln. Fewer people know of the Peterson House, where the stricken president was carried and treated, and where he died the next day. Now, a team of Lancaster County woodworkers is toiling to restore the federal-style rowhouse in Washington, D.C., which has fallen into decline. "The National Park Service...wants to save it from falling apart," Chuck Groshong, co-owner of Historic Restorations at 341 E. Liberty St., said. "There had been some repairs down over the years that were shortsighted. There were a lot of 'Band-Aid' solutions. Now they have a plan." The Peterson House, built in 1849 by a German tailor, is owned by the federal Department of the Interior and is maintained as part of the.... To read the full article, click on the picture. Click here to read the Historical Architectural Review Board testimonial. 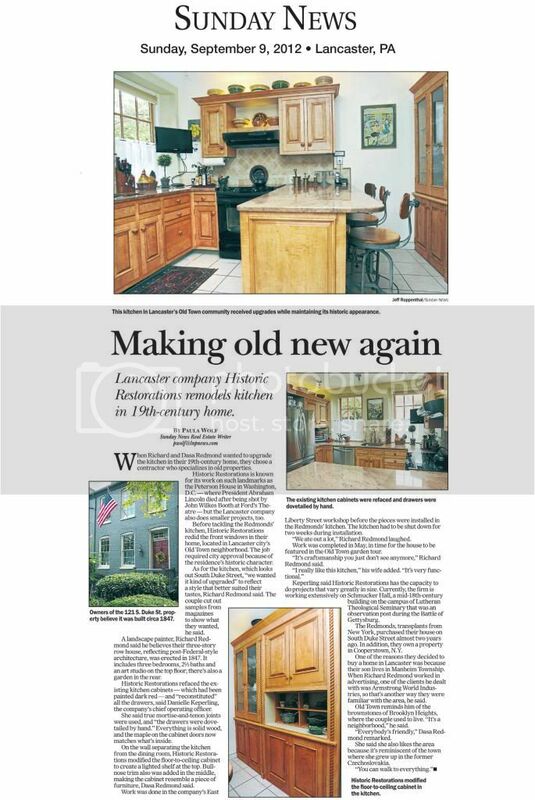 Sunday News, Sunday, September 9th, 2012, Lancaster, PA Making Old New Again When Richard and Dasa Redmond wanted to upgrade the kitchen in their 19th-century home, they chose a contractor who specializes in old properties. 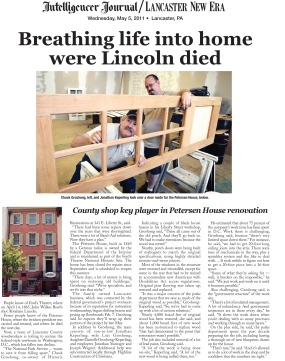 Historic Restorations is known for its work on such landmarks as the Pterson House in Washington, D.C. - where President Abraham Lincoln died after being shot by John Wilkes Booth at Ford's Theare - but the Lancaster company also does smaller projects too. 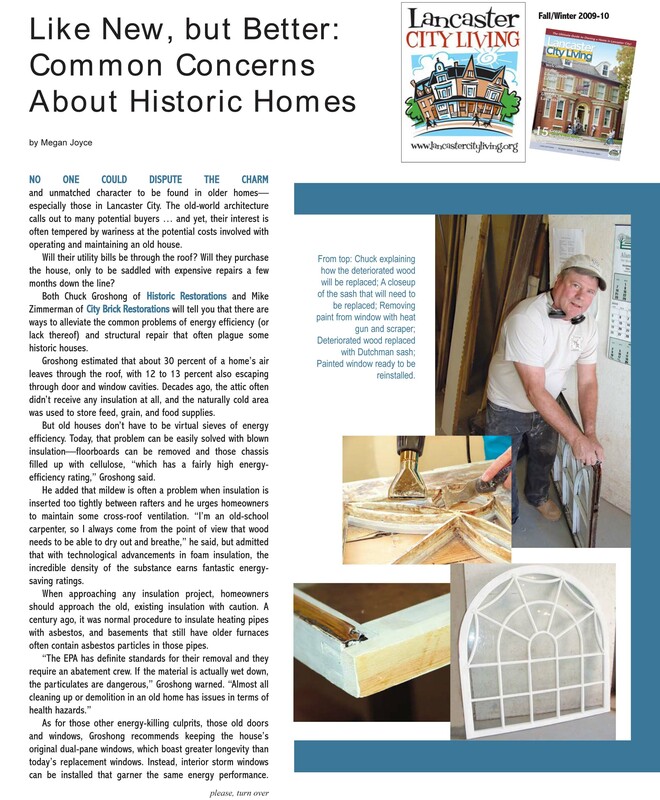 Before tackling the Redmonds' kitchen, Historic Restorations redid the front windows in their home, located in Lancaster City's Old Town neighborhood. The job required city approval because of the residence's historic character. ....to read the full article, click on the picture on the right. "Our carpenter was Chuck. Thankfully, he knows much more than we do about restoration details. We feel his work and expertise are outstanding." -- Gib and Marty. Lancaster New Era, Thursday, April 24, 2008, Lancaster, PA Chuck Groshong is an artist who fears his art is dying. He takes a traditional approach to building, sticking with mortise and tenon in a particle-board world. 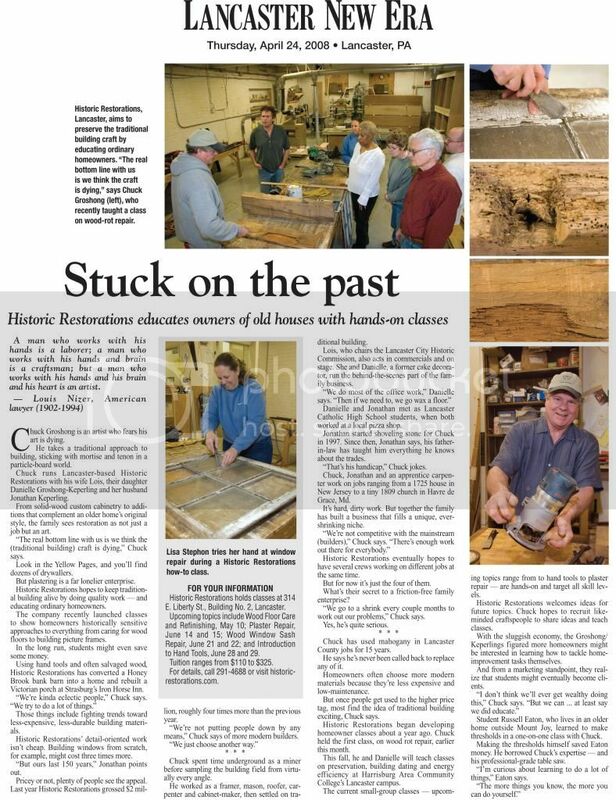 Chuck runs Lancaster-based Historic Restorations, along with his wife Lois, their daughter Danielle Groshong-Kerperling, and her husband Jonathan Keperling. From solid-wood custom cabinetry to additions that complement an older home's original style, the family sees restoration as not just a job, but an art. ....to read the full article, click on the picture on the left. Lancaster City Living, Fall/Winter 2009/2010 No one could dispute the charm and unmatched character to be found in older homes — especially those in Lancaster City. The old-world architecture calls out to many potential buyers … and yet, their interest is often tempered by wariness at the potential costs involved with operating and maintaining an old house. Will their utility bills be through the roof? Will they purchase the house, only to be saddled with expensive repairs a few months down the line? Both Chuck Groshong of Historic Restorations and Mike Zimmerman of City Brick Restorations will tell you that there are ways to alleviate the common problems of energy efficiency (or lack thereof) and structural repair that often plague some historic houses.....to read the full article, click on the picture on the left. You have seen what we say about ourselves. 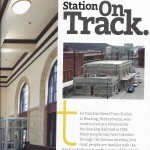 In the Fall of 2013, the Franklin Street Train Station project won the Architectural Woodwork Institute’s “Award of Excellence” and was featured in an article in the Fall 2013 edition of their Design Solutions magazine. “Thanks for all your efforts and particularly the guidance and recommendations during the restoration of the Mylin Farmhouse. You are particularly diligent and committed to the end result and I’m sure we are not the only customer to have benefited. …. click here to read the full article. “I started my life in an old house,’’ says the native Nebraskan. and demolition of properties within the Heritage Conservation District. 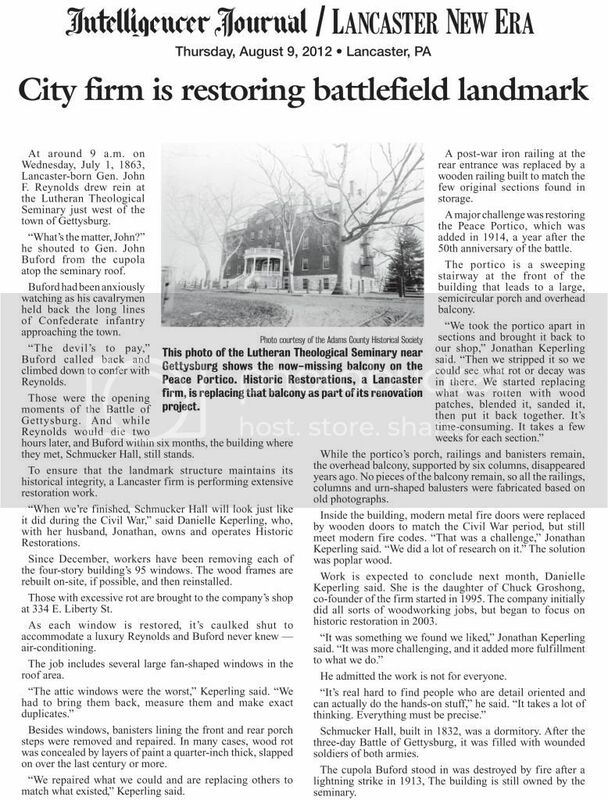 The 64-year-old is a partner at K&G Artisan Builders, which is also known to local residents as Historic Restorations. Old buildings, she notes, have survived all kinds of changes and they have stories to tell. “To me it’s about taking care of them and keeping that piece of our history alive,’’ she says. ….to read the full article, click on the picture on the right. At around 9 a.m. on Wednesday, July 1, 1863, Lancaster-born Gen. John F. Reynolds drew rein at the Lutheran Theological Seminary just west of the town of Gettysburg. “What’s the matter, John?” he shouted to Gen. John Buford from the cupola atop the seminary roof. Buford had been anxiously watching as his cavalrymen held back the long lines of Confederate infantry approaching the town. “The devil’s to pay,” Buford called back and climbed down to confer with Reynolds. Those were the opening moments of the Battle of Gettysburg. And while Reynolds would die two hours later, and Buford within six months, the building where they met, Schmucker Hall, still stands. To ensure that the landmark structure maintains its historical integrity, a Lancaster firm is performing extensive restoration work. “When we’re finished, Schmucker Hall will look just like it did during the Civil War,” said Danielle Keperling, who, with her husband, Jonathan, owns and operates Historic Restorations. People know of Ford’s Theatre, where on April 14, 1865, John Wilkes Booth shot Abraham Lincoln. Fewer people know of the Peterson House, where the stricken president was carried and treated, and where he died the next day. Now, a team of Lancaster County woodworkers is toiling to restore the federal-style rowhouse in Washington, D.C., which has fallen into decline. The Peterson House, built in 1849 by a German tailor, is owned by the federal Department of the Interior and is maintained as part of the…. To read the full article, click on the picture. When Richard and Dasa Redmond wanted to upgrade the kitchen in their 19th-century home, they chose a contractor who specializes in old properties. Historic Restorations is known for its work on such landmarks as the Pterson House in Washington, D.C. – where President Abraham Lincoln died after being shot by John Wilkes Booth at Ford’s Theare – but the Lancaster company also does smaller projects too. Before tackling the Redmonds’ kitchen, Historic Restorations redid the front windows in their home, located in Lancaster City’s Old Town neighborhood. The job required city approval because of the residence’s historic character. “Our carpenter was Chuck. Thankfully, he knows much more than we do about restoration details. We feel his work and expertise are outstanding.” — Gib and Marty. Chuck Groshong is an artist who fears his art is dying. He takes a traditional approach to building, sticking with mortise and tenon in a particle-board world. Chuck runs Lancaster-based Historic Restorations, along with his wife Lois, their daughter Danielle Groshong-Kerperling, and her husband Jonathan Keperling. From solid-wood custom cabinetry to additions that complement an older home’s original style, the family sees restoration as not just a job, but an art. ….to read the full article, click on the picture on the left. No one could dispute the charm and unmatched character to be found in older homes — especially those in Lancaster City. The old-world architecture calls out to many potential buyers … and yet, their interest is often tempered by wariness at the potential costs involved with operating and maintaining an old house. Will their utility bills be through the roof? Will they purchase the house, only to be saddled with expensive repairs a few months down the line? Both Chuck Groshong of Historic Restorations and Mike Zimmerman of City Brick Restorations will tell you that there are ways to alleviate the common problems of energy efficiency (or lack thereof) and structural repair that often plague some historic houses.….to read the full article, click on the picture on the left. As it expands for the first time in years with its Providence Park neighborhood, Willow Valley Retirement Communities is also busy preserving Lancaster County’s history. 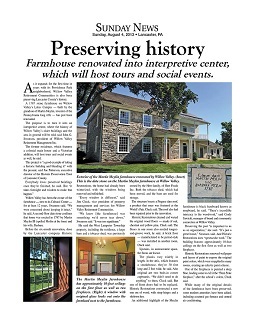 A 1787 stone farmhouse on Willow Valley’s Lakes Campus — built by the grandson of Martin Meylin, inventor of the Pennsylvania long rifle — has just been renovated. The purpose is to turn it into an interpretive center, where the history of Willow Valley’s older buildings and the area in general will be told, said John G. Swanson, president of Willow Valley Retirement Management Inc.